The Ink Trap: Kenny K Introduces...The Rock Squad!! Kenny K Introduces...The Rock Squad!! Kenny K has been hard at work creating fabulous new images for everyone to enjoy! The Glam Gang stole your hearts...The All Starz satisfied your sporty side...The Gothik Angelz made your brain sizzle....and now...without further adieux...I give you...The Rock Squad (and the crowd goes wild)! These 15 images are funkalicious and music is the name of the game. You should have arrived here from Paola's awesome blog and your next stop is Bev's blog. She has a fab card waiting for you over there. If you get lost along the way, head back to Kenny K's Krafty Girlz Challenge blog to see the entire hop list. Also, don't forget to enter the music themed challenge this week. So many ways to win! o o o what a great cards.....finally not some cute images. Wow your cards are beautiful! The colouring is perfect! Wow... your colouring just blows me away ~ it's brilliant. I love the touches of sparkle on Bass Baby too. I love Kenny images, they are favulous! wow these cards really rock. love the embelischments you used on the masculine cards. great colouring too. wauw you'r cards look amazing! love the simpicity but jet the strong look theye have! the coloring is just amazing! 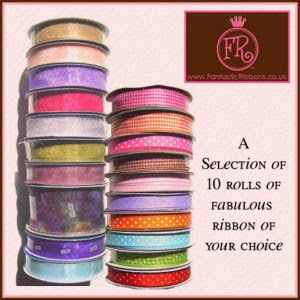 So pleased to have visited your blog in this great blog hop ! Absolute fabby cards. Love the images, colouring and elements used. Love these kool images. Oh wow, three amazing cards! Your colouring is totally and unearthly fabulous! oooh you made great cards!!! Everytime when i see those stamps of kenny k i've got a great smile on my face! You've made beautiful cards and i love your colour work! Everytime I am lost for words when I see your dreations Cheryl! Absolutely fabulous cards. Lovin these new images. Soo funky. Wow, cool cards, your coloring is fab !! Fantastic cards loving these new images, and fantastic prizes. Totally awesome cards!! You can almost hear the music! Wow, wow, wow your colouring is absolutely amazing!!!! I worship at your feet!!!! Fab cards!!! They have blown me away! looks amazing! You've got great coloring skills! Love the cards youu've made! oh my goodness, what fantastic cards!!! Stunning is the only way I could describe them, your colour work is brilliant!!! WOOOOOOOOOOOOOOOOOOOOOOOOW! Your cards are awsome! looooooooooove your coloring!!! These are my favourite cards in this hop so far. Just AMAAAAAAAAAAAZING! Wow! Wow! and Wow! again, you are so right, these images are just phenomenal. I've had a wonderful time so far on the hop and had some great inspiration from all the girls. What more can I say. Your cards just ROCK. My DH is an old Rocker, guess what card he's getting on his next Birthday. Thank you. These three cards as well as your other Kenny K creations are a true inspiration with your wonderful coloring techniques. Keep them coming. Amazing cards. Oh how I wish I could colour like you!!! - I love Kenny K's designs. 6th hop ! OMG, these 3 cards are FABULOUS, AMAZING !!!! All in these card is beautiful : color, copic job, layout !!! I'm your FAN ! Loving your cards dear and such wonderful detail into each of them. You have made the coolest cards ever. Great. WWWow these cards really rock,love the way you colored them,great details. Love, love, LOOOOOVE them all! BIG hugs and have a wonderful Sunday. OMG...what can I say that hasn't been said before?? Well, your cards ROCK!! Amazing coloring that really brings life to the images. Great job, Cheryl. Wow!!!!! Your cards are amazing. Your colouring is outstanding and these images are so cool. ALL three of your cards are amazing!!! Love them. Really love the drummer at the end. Your cards are awesome just when I think that cant get any better, WOW there awesome. OMGosh your cards are SICK, Cheryl (I totally mean that in a good way, hun,smile)! You have ROCKED the stadium with this release...beyond beautiful, hun! I can just sit and stare at your stunning colouring all day long...I adore Bass Baby...I think she is my fave from the new ROCK Squad release but I am also crushin' on Tommy Lee...again...I am reliving my troubled youth as a heavy metal chick with the fab new images,lol! 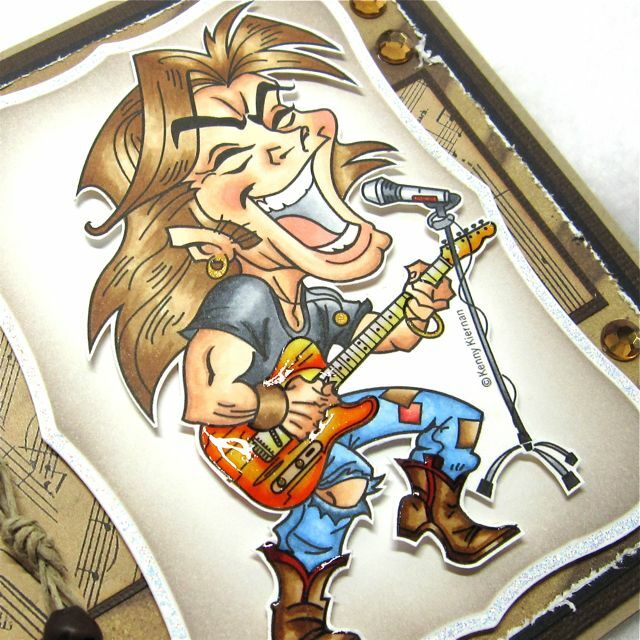 Fantastic rockin' cards!! This hop is amazing!!! What a fabulous job! You have been busy! Ilove all three cards! TFS! Wow....awesome cards. You did a fantastic job on all of them. I am loving these new images! OUTSTANDING~~~I am speechless with these images and your touch to them is FABULOUS!!! Each one is Beyond Excellent!!! Your work is tremendously inspirational!!!!!!!! I especially love the grey jeans - the shading is fantastic. Oh My!! I thought the card on the last blog was my favorite. WOW!! Your cards have such a WOW factor!! Cheryl they are just A W E S O M E!!! The drummer guy is perfect for a friend who fancies himself as a Rock Star! Wonderful wonderful colouring - you are a very talented lady. Your colouring is absolutely fabulous. Wonderful cards! WOW!! I have to say this week your cards are definitely my fav's. From the coloring to the papers you used to the embellies. Great job!! Awesome cards! your coloring is fabulous! WOW! You really outdid yourself on these beauties! You took these cuties and ran with them...great work! Wow! Your cards are amazing! You go girl! Thank you for sharing your talent! I'm definitely inspired! First I saw rock dude and loved his muscles! !, but than I saw Bass Baby and wow, you did a great job!!! Metal Drummer is fine too, but just love her!!!!! Gorgeous projects! Off to hop! Oh Wow, these are great. You colored them perfectly. All 3 cards are awesome!!! Your crda really do ROCK! The coloring is fabulos! You have just made them come to life! Love your designs. Your colouring is out of this world!! Wow, these look like you had a lot of fun. Fantastic coloring and card embellishments. These are my faves of the new images. really interesting cards! thanks for the chance! Hi! thank you very much for the opportunity to participate for this important award! how nice your cards with a dazzling color! thank you very much! Love these Kenny images. Great card you have created. The first makes me think of Rod Stewart but it's the second I really like - those colours so well set off by the white circle in the centre & the addition of yellow a masterstroke in colour enhancement. How great are your cards!! 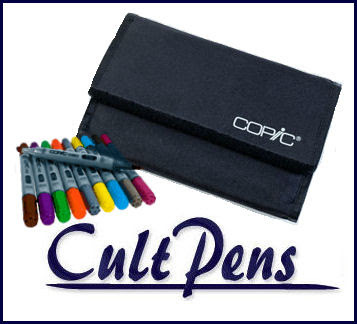 oooooooooooooooooh they are awsome ,your coloring kick me out of my chair. GORGEOUS! I love each one. Especially love bass baby. she is fabulous! Great layouts and your colouring is amazing! Too funny-loved your write up!! Your cards are great and your coloring of all the images is just amazing. Well done!! Great cards!!! You sure bring these characters to life!!! Off I hop! Great cards and the coloring is wonderful. Love how each image was perfect for your design. Your coloring just blows me away everytime I see something new! Great job! Wow, yours cards are beautiful! Love your coloring! I love the drummer! Thanks for sharing! Great cards! Perfect for some teen girls! Really great cards. You've done a fabulous job on all of the images. Oh wow these are just amazing!! They are sooo full of energy!! Brilliant! Love your work and creativity. Cool cards and lovely colouring! WOW, LOVE your coloring on these! TFS! some great creations babe well done think I really need some of your Inspiration.. I am in love with that sparkly Bass Baby - you've done a great deal of justice to all 3 of the images you got to play with. Thanks for sharing them! Awesome cards! Love the detail on each of them. The twine, brads, everything is perfect! This is one rockin' hop. Your cards are truly amazing. I've enjoyed seeing your work with these funny images. Thanks. Your cards are just amazing!! Love what you've done with these rockers! Your alls work is way to good!!! All of you guys! I wish my work could look like this. Sorry being envious of such great workmanship! Kenny's images are the best. Your technique inspires me to think outside the box. Strong and vibrant! Thanks for a chance to win! WOW!!!! I do believe these three are my favorite images! And your cards are all stunning!! Love them all, the skull buttons on the first one are cool, I love your bass babe card and the skull brads really have a great effect on the third... to top it all off, I think your colouring ROCKS! Dear Cheryl,,,,, 133 comments. Oh my goodness. Well I only want to comment on your rockband. I LOVE THEM, YOU ROCK GIRL!!!!! I love these images. Your cards are amazing!! So fabulous creations ! yeah ! Your card ROCKS!!! I love your style! Wow! Great coloring and the cards are awesome! 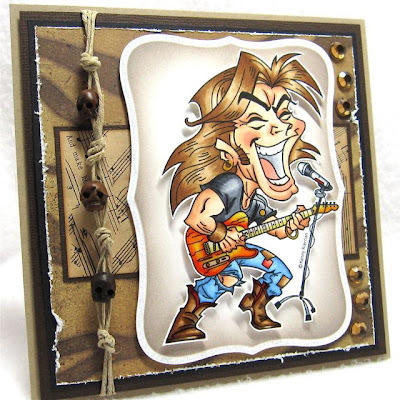 Love that each card seems to have its own personality to match the rocker image. Holey moley you can color! I'm blown away by all your cards and so happy I hopped along the trail to find you. Click - you've got a new follower! What great cards! I absolutely love the dps you used with these cards. Great coloring on all of them! Super card samples--you are so talented! Thanks for sharing!!! OMG! I luv your cards!! Your coloring tech is amazing..all I can saw is "wow"! Fabulous cards and great papers for those images. Just found out about these images....fantastic! Your cards look wonderful-especially the coloring! Love the stamps! Amazing job coloring up your images! Beautiful work! Awesome cards and I absolutel love all the new images. 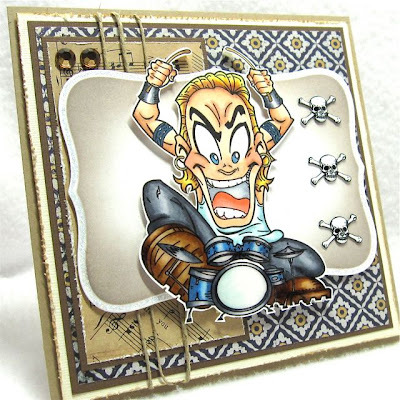 Perfect for guys cards! Okay I'm hoppin to the next blog for more fantastic inspiration. Your colouring is amazing! You have done a fantastic job with these images. Great job! OMGoodness!!! What WONderful cards! You have a great talent! Thanks for sharing it with us! Fabulous cards, awesome coloring and designs. really trendy cards!! love them!!!! Wow! Three cards...you were a busy lady! You did a wonderful job on all three. What awesome cards you have made! 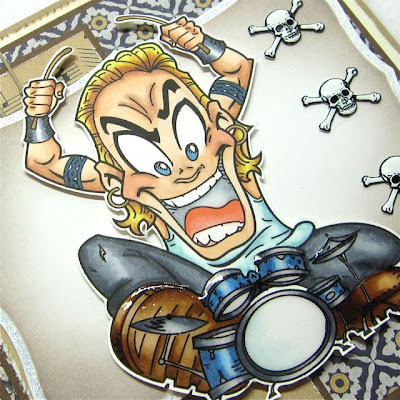 I love the drummer card the best (I always did like the drummers..), but the other two cards are just as amazing! Perfect! You definetly ROCKED the rock squad Cheryl!LOL!! Fabulous cards!! Love what you did with these images! Mail from Mom...On the Dark Side! Blog Hopping with the Bombshells! A New Challenge at Kenny K's! A New Kenny K Challenge! I can see clearly now, the rain has gone! 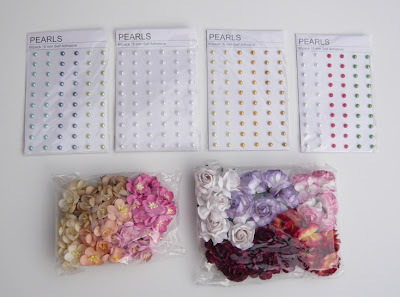 La-La Land Craft's Blog Candy! Day 6 of Lala's Birthday Beach Bash! Introducing Kenny K's Gothik Angelz!